Cookies are quick and easy to make and can be a good introduction to cooking and baking for children. These orange flavoured cookies are light and slightly crispy with a strong hint of orange and cardamom that enhances the orange flavour. This recipe is not one to help you lose weight! The main ingredients are sugar, butter and flour, all of which contribute many calories. However, having said that, they are impossible to resist and fly off the plate as fast as they are cooked. These quantities make about 12 - 15 cookies depending on how thick you cut the dough. Preparation takes about 20 minutes, resting 2 - 3 hours and baking just 10 - 12 minutes at 180°C. 8 - 10 green cardamoms, remove shells and grind seeds finely. 1/2tsp Cardamom powder will suffice instead but fresh is better. Zest of one medium size fresh orange. Use a zesting scraper or grate the outermost layer of the skin with a fine grater. 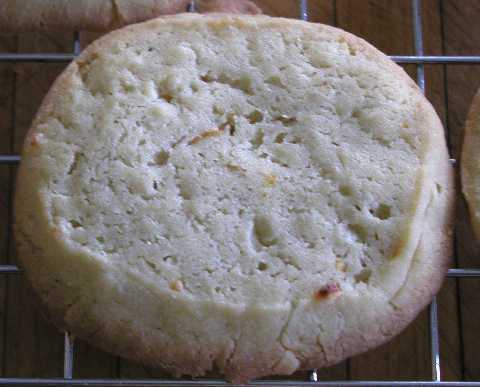 You will also need a large non-stick baking tray with room for the cookies to expand to 3" (7cm) dia. Cream the butter in a medium to large size bowl. Make sure that the butter is warm but not melting and cream with a spoon until it is smooth and slightly fluffy. Add the sugar and mix in carefully, then whisk until the mixture is fluffy again. Add the egg and orange zest little by little and whisk to a slightly fluffy texture again. Combine the cardamom, salt and flour together in a separate bowl by sieving to remove lumps. Add the flour mixture to the creamed butter mix little by little whilst still stirring. Continue until all the flour is added and evenly combined. The mixture will start getting quite stiff and dough-like. At this point you can start using your hands, make sure that the flour is evenly mixed in. Using your hands again, knead the soft dough mixture on a floured surface and roll it into a smooth cylinder about 6" (15cm) long and 2" (5cm) diameter. Wrap the cylinder in cling wrap and place in a fridge for 2 - 3 hrs until the dough is quite stiff. Pre-heat the oven to 180°C, Gas mark4 or 350F. If using a fan oven use a lower temperature, about 10°C less. You do not want the cookies to burn. Grease the baking tray with a little butter to prevent sticking. This tray should be very flat to prevent the cookies sliding around too much. If you do not have one large enough, cook them in two batches. Do not be tempted to crowd them, they will flow and stick together. 3" (7cm) cookie rings could also be used. Remove the dough from the fridge, unwrap it and cut it into discs about 1/4" (6mm) thick. Place the discs on the tray leaving plenty of space between them. Pre-heat the oven to 180C, Gas mark4 or 350F. If using a fan oven use a lower temperature, about 10C less. You do not want the cake to cook too quickly or burn on the outside. Put the tray in the oven and cook the cookies for 10 - 12 minutes. Watch for when the edges are just going brown. 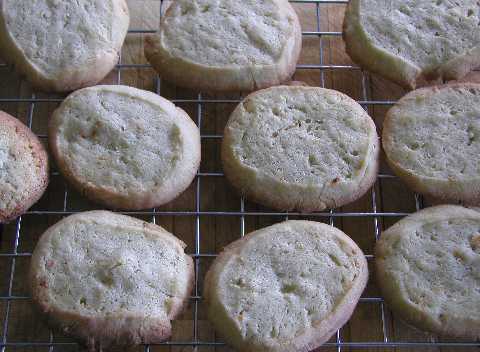 The cookies will harden slightly as they cool and will be slightly soft when hot. Remove from the oven when cooked and allow to cool a little before turning on to a metal grid. Allow to cool properly before eating - if you can! The cookies will keep well for several days in a tin. Many more cookie recipes can be found at www.easy-sugar-cookie-recipes.com.